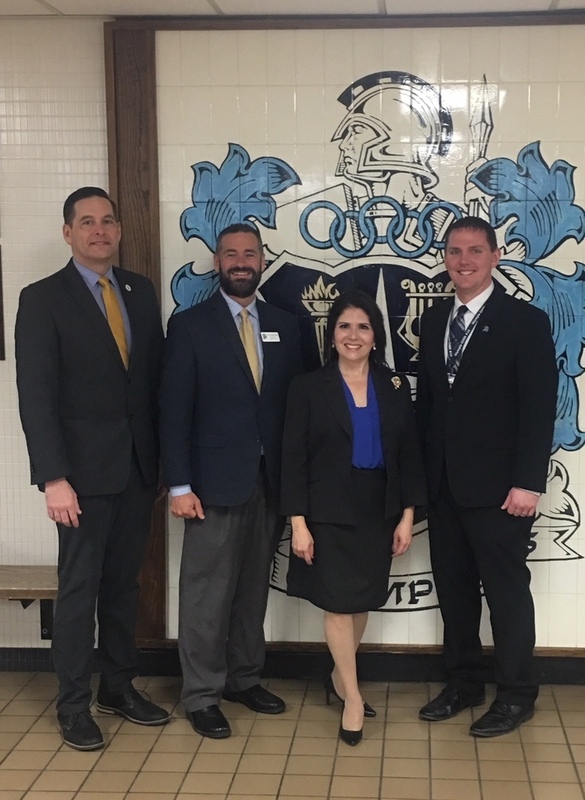 On Thursday April 5th Illinois Lieutenant Governor Evelyn Sanguinetti spent the afternoon at Olympia Middle School. Lieutenant Governor Sanguinetti visited a few classrooms at OMS and then spent time meeting with the 6th Grade class congratulating them on earning the Illinois Biodiversity Field Trip grant. Through the years that the grant has been offered to students by the Department of Natural Resources, there has been $1 Million provided to schools and 100,000 students that have been able to participate in field trips as a part of the program. During their time at Funks Grove, the students will travel to a variety of learning stations to learn about the biodiversity of Illinois (and the threats to it) and will learn about the importance of stewardship and volunteering. Students will also assist with a variety of activities including, but not limited to: tree/shrub planting, mulching gardens, exotic species eradication, and trail maintenance. They will finish their experience with making s'mores at the campfire. OMS was glad to host Lieutenant Governor Sanguinetti, State Representative Tim Butler, and McLean County Sheriff Sandage for this special event.